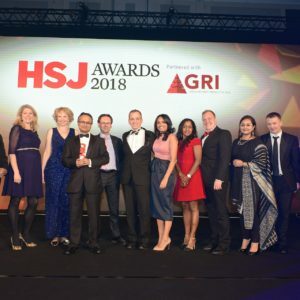 Our RAPID (Rapid Access to Prostate Imaging and Diagnosis) project won the prestigious HSJ Award for Acute Sector Innovation 2018 from a strong competitive field of 49 submissions. The judges commented that they selected RAPID due to the broad reaching and truly collaborative nature of this project while always keeping the patient at the forefront of the innovation. They were particularly impressed with how far the project had been shared nationally and the keen focus on patient experience to continue to develop and drive improvement. The overall clinical lead for RM Partners RAPID project and pioneer of this approach, Professor Hashim Ahmed, Imperial College Healthcare Trust, said ‘This is an exceptionally proud moment for the individuals, Trusts and teams involved. The RAPID pathway is the definition of true transformation and the recognition of this through this award is now an excellent platform to launch this revolutionary pathway nationwide’. More information about RAPID is available here. RAPID patient information video is available here. RAPID information video for healthcare professionals is available here.